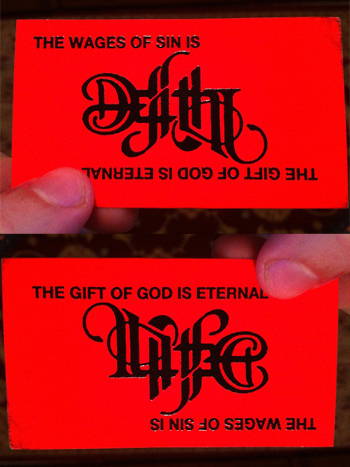 I couldn’t help being guiltily delighted by this evangelistic business card which I found on Reddit atheism this morning (thanks be unto rchayes89 for snapping and then posting it). In fact, I love it almost as much as I love my Barry Manilow record collection. 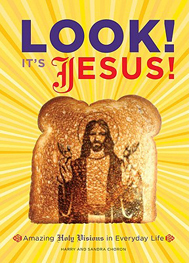 The card, which puts the cheese back into ‘Jesus’, is brilliant on so many levels. There’s the day-glo red card and the budget heat printing which dollops shiny black ink on the surface – both so 1970s. But best of all is the reversible type in the middle, straight out of the School of Heavy Metal. It’s tacky. It’s cheap. It’s in your face. What’s not to love? From the scuffed edges of the card, it looks like this has been given back a few times. Which is a shame. I’d endure a 20-minute ear-bashing from a street evangelist just to get one. P.S. Just to be clear, that Barry Manilow reference was ironic, OK? Which generates more social engagement: vacuous tweets by celebs with tens of millions of Twitter followers, or motivational tweets by religious leaders with followers in the thousands? According to On Twitter, God is Greater than Glitter, a New York Times story, it’s the religious tweets which win out, with huge numbers of retweets and favoriting. All of which must be making the angels cheer while Lady Gaga and Rihanna slink back to their gilded hotel rooms sick with envy. Growing older is automatic. Growing up is a choice. Rick and Joyce may have 626,000 and 993,000 followers respectively, but on this evidence they are sending their followers tweets straight out of The Book of Well, Duh. (In fairness to Rick, not all his posts are this saccharine.) At least Lady Gaga’s tweet, which revealed that she glued pearls to a mask on a flight to Korea, was personal and intriguing, even if it didn’t raise a storm of retweeting. But Rick and Joyce are not alone. You don’t have to search very hard on Twitter to find its deep stream of piety, with people happily announcing 24/7 that God never closes a window without opening a door (which frankly makes him sound a bit OCD), that they’re not looking for a hole in the ground but a hole in the sky, and that the Lord never sends us burdens greater than we can carry – an observation coined in the days before God gave us suitcases on wheels. But out cliché-ing everyone else in social media is Jesus Daily, a Facebook page with approaching 13 million likes. Founded by Dr Aaron Tabor, an anti-aging skincare specialist, Jesus Daily was crowned most engaging page on Facebook in 2011, smiting Justin Bieber and Real Madrid into 5th and 8th places respectively. LIKE if everyone should be able to read the Bible! 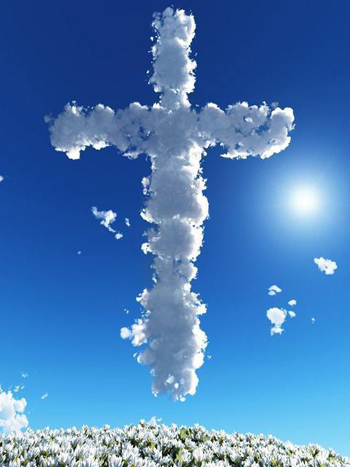 LIKE if you believe ALL THINGS ARE POSSIBLE WITH GOD! LIKE if you thank God for great mothers! We love you. LIKE if JESUS is your BEST FRIEND! That last example received 241,328 likes, 4,163 comments and 19,959 shares, which makes the Jesus Daily brand a Facebook success by any measure. But its easy piety, offered every day to its ‘me too!’ audience, is like shooting ichthus fish in a barrel. The page’s creators know exactly what to say and show to manipulate their followers, and the truthlets they peddle are so worn down by mindless repetition that the main thing they do is make people feel nice about their faith. That, of course, is what piety always does. It pressures you to agree with its simple beliefs and then reassures you that you – along with 241,328 others! – are an accepted member of your religious tribe. Praise the Lord! Clicking that LIKE button tells me I’m among the countless saved, rather than the damned! Piety is a fake form of faith, as it can never be true to the messy experience of people who live as fallen human beings struggling in their journey to God. Jesus always resisted piety and instead said awkward and difficult things which were not designed to build audiences. He was the polar opposite to Jesus Daily, with its oppressively positive tone, not to mention its pictures of Jesus with shampooed hair, dirt-free fingernails and rugged good looks. I know I’ve gone for the negative in this post, but for me piety has always been one of the big enemies of faith. I take from it all the challenge of communicating a truly human faith in the different online worlds we live in. My lifelong fascination with ‘the far side’ of Christianity easily includes the Catholic Chuch’s love affair with relics, although I must confess some sympathy with it all. It’s a deeply human thing to show respect to what remains of those we’ve loved after they’ve died and the photographs, letters and books of people in my family which have come down to me are beloved things. So the early Christian practice of meeting at the gravesides of the martyrs and placing their portrait paintings in churches seems absolutely right to me, even though it’s not for everyone. But what about collecting bones and skulls, inspecting the bodies of dead saints and parading their body parts through the streets? Call me squeamish, but it just seems macabre and obsessive, not to mention terminally out of step with modern culture. Believing the Christian faith is hard enough these days without throwing in veneration of the big toe of St Bob the Bizarre. Back in May this year, a syringeful of John Paul II’s blood, taken from him before he died, was venerated in his beatification mass in Rome, while another found its way to Krakow in Poland. His body has already been moved upstairs from the basement of St Peter’s into the church, and it’s a disturbing possibility that the Vatican’s resurrection men might be visiting his coffin for bits and pieces sometime in the future. 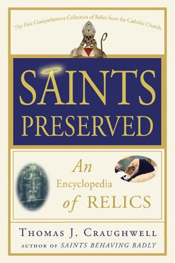 Which is why I was curious to get hold of a copy of a new book, Saints Preserved: An Encyclopedia of Relics, by Thomas J Craughwell. This is a book which knows where the bodies are unburied. If you want to get on a plane to go and venerate one of the many skulls of St George, the Holy Bench Jesus sat on during the Last Supper, the eye of Blessed Edward Oldcorne (don’t ask), the humerus of St Francis Xavier or even the skis of John Paul II, this is where to start. I’m disappointed though that Craughwell doesn’t pass much critical comment on the history or authenticity of the relics he lists. Many of the saints’ relics are genuine, but all the claimed biblical objects must be regarded as frauds perpetrated on credulous believers. It’s a fraud the Church has colluded in over the centuries. Take the Holy House of Nazareth, for example, where Jesus, Mary and Joseph lived, which was flown by a team of house-moving angels to Loreto in Italy in the 13th century. A virtual queue of Popes visited the house to bless it and bestow privileges, and only Julius II demurred by adding the words, ‘as is piously believed and reported’ to an account of the shrine’s legend. However, there are some signs of change, as witnessed by the curious story of the Holy Prepuce (the foreskin of the infant Christ), which was the subject of another book, An Irreverent Curiosity, which I read a few months ago. According to the book, written by American journalist David Farley, the Holy Prepuce was venerated every January 1st (the feast of the circumcision of Christ) by the people of Calcata, an Italian hill town. This went on for almost four centuries without a problem until 1900, when Pope Leo XIII took the highly unusual step of censoring all mention of the relic on pain of excommunication. The blessed foreskin had become an almighty embarrassment. But then things went further. In 1983, the priest of Calcata told his congregation that the Holy Prepuce had been stolen from the shoebox in his wardrobe, where he had kept it for safety, and it has never been seen again. Locals believe it was snatched by Church officials to be ‘disappeared’ into the Vatican. Other uncomfortable relics, such as the breast milk of the Virgin Mary, have also been sent into retirement. Like most traditional elements of Catholicism, the cult of relics has been enjoying something of a revival under John Paul II and Benedict XVI. Their Church has renewed its love of bloodstained shrouds and holy bones. For them, God moves not only in mysterious ways, but in medieval ones too. Not being a Catholic myself, I always experience an illicit thrill when walking into a Roman church, long-lost black sheep of the family that I am. I feel like I imagine a nun must feel walking into a lap-dancing club… just a bit out of my depth. I do know how to find my way round, though. How to fake the sign of the cross, how to find a friendly saint among all the bleeding and weeping statues, where to buy a candle, where to sit quietly to think and pray. The thing I’ve not been able to crack is the confessional box. I’d love to sit inside one of the frightful old things with their creepy Gothic look, except I’m sure they have central locking triggered by a priest watching on CCTV and walls that close in on you. 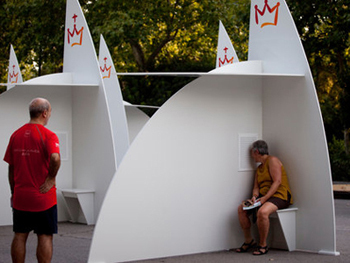 But confessional boxes just got a whole lot friendlier thanks to the open-air models that have been knocked together, IKEA-like, in a park in Madrid. They’re part of World Youth Day, a big Catholic event happening this week. Now you can get your sins off your chest in the sunshine and fresh air instead of behind a pair of heavy velvet curtains sourced from the set of The Addams Family. The Diocese of Madrid is even offering women who use the prefab confessionals forgiveness for having an abortion, which is normally an excommunicating offence in the Catholic Church. That would be really nice of them if excommunication wasn’t such a cruel and bizarre response to the pastoral situation of abortion in the first place. I’ve just added the IKEA confessional box to the Ship of Fools Gadgets for God pages. A South Carolina couple, Jacob and Gentry, went shopping in Walmart for pictures a couple of weeks ago. They found a picture which made headlines around the world, but it wasn’t one of the ones they bought in the store. Because a few days later, as Jacob was walking out of his kitchen, the Walmart receipt, lying on the floor, caught his eye. It had strange, dark markings on it. Curiously, spontaneous images of Christ have a long history. One early legend, dating back to the 6th century or maybe earlier, tells of how Jesus turned down an invitation to pay a visit to the King of Syria. He RSVP-ed by sending the king a cloth he had used to wipe his face. When the king opened it, the face of Jesus was printed on the fabric. Art historians say legends such as this were developed to provide much needed theological support for the explosive growth in popular images of Jesus, Mary and the saints. Christians of the time were using mass produced holy images in highly superstitious ways, hanging them up in their homes and workshops as good luck charms. Those who championed this popular devotion promoted the legends in a brilliant (and ultimately successful) piece of PR, saying that images were ok because they originated in a miracle of Jesus himself. 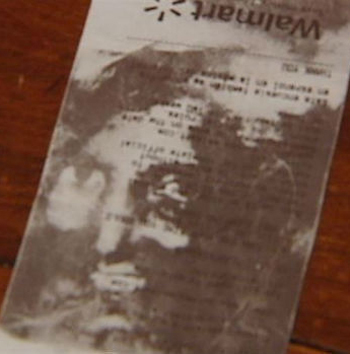 With all due respect to Jacob and Gentry, Christians who get excited about God performing a conjuring trick with a Walmart receipt are also perilously close to crossing the line between miracle and magic. One of the questions always raised by stories such as this is why a stain looking like a man with a beard should always be identified in the media as Jesus? People posting comments on blogs and Twitter over the past week said they saw Charles Manson, Josef Stalin or Rasputin, rather than Jesus. ‘Even a blind person can see that this is Osama Bin Laden,’ said a commenter called gotjapanka on YouTube. But Christianity has form in this area. Stories of plaster saints which weep and bleed – and even wink or lactate – are still quite common, and although they can also occur in Hinduism, for example, it is the Catholic stories which are strong in Western folk memory. Even though Christians brought up on Monty Python are able to laugh at reports of Jesus and Mary appearing on a pizza near you, I think many believers are slightly beguiled by the stories almost to the point of wishing they were true. There are good reasons for this. Firstly, these visitations are invariably tacky. I’m thinking of the toasted cheese sandwich which looked vaguely like the Virgin Mary and which ended up being bought by an online casino for $28,000. And also the Jesus-shaped shadow cast by a tree on a caravan park fence in Australia which caused the person who saw it to exclaim ‘Jesus Christ!’ – and not in a holy way. These are tales of transcendence meeting trailer park. That is what makes them hugely entertaining, of course, but it also has a certain appeal to Christians, because holy things appearing in humble locations is what the faith of Jesus is all about. Well, yes… but isn’t that so New Testament? Jesus was born in a barn. So is it any surprise that he shops at Walmart? If Jesus is going to appear anywhere today, then a pizza shop, supermarket or casino sound exactly right. However, any Christian tempted to believe that God engages with us today via fuzzy images of a man with a beard should remember some of Jesus’ last words to the first disciples. He told them to go into all the world. It is surely through flesh and blood human beings, rather than stains on checkout receipts, that Jesus touches the earth now. A new titanic Jesus statue seems to be going up every year. 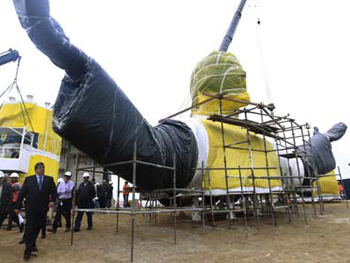 Last November saw a local Catholic priest realize his dream to put up the world’s tallest Christ in Swiebodzin, Poland, and this year it’s the turn of the President of Peru, who has fast-tracked a gargantuan Saviour for the city of Lima. The statue, which will face the Pacific, is to be unveiled this month, and will ‘bless Peru and protect Lima,’ according to the President. There’s some confusion, though, about whether this will be the tallest Jesus of them all. Media reports say the Lima statue will be 37m tall, but that appears to include a 15m pedastal, which reduces our Lord himself to a mere 22m. Hopefully more news soon on the thrilling question of who has the biggest Jesus of them all, a revelation which is possibly of more interest to male readers. I went yesterday to the British Museum’s press launch for their major summer exhibition, Treasures of Heaven. The show promises to shine light on one of the most curious – not to say bizarre – aspects of the Christian faith: the devotion shown to relics. Statues of saints and their relics were smashed or forcibly removed from British churches in the 16th century Reformation, and might seem like an obscure historical footnote now. But as Neil MacGregor, director of the BM, pointed out at the launch, relics were hugely significant objects in medieval Europe, bringing power, prestige and wealth to towns and cities, especially if they became the destination of pilgrims. Talking about one of the exhibition’s star relics, a thorn said to be from Christ’s crown of thorns and housed in a kitschy gold reliquary (seen above), MacGregor quipped that ‘at the second coming, Christ would make a point of coming to Paris to collect his thorn.’ It was this kind of belief about relics which put medieval cities on the map. 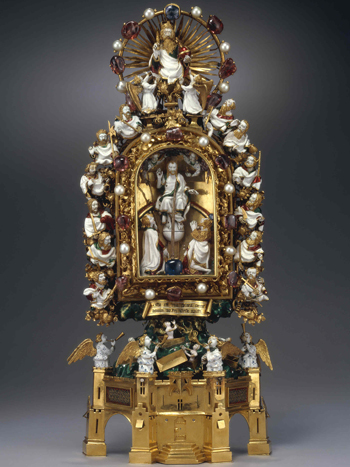 The exhibition will bring together relics, reliquaries, manuscripts, prints and pilgrim badges from more than 40 institutions around the world, including the private chapel of the popes in the Vatican. The chapel is sending the Mandylion of Edessa (or a 5th century copy of it, at any rate) which is rarely seen in public, so that will be an event in itself. I was told that staff at the museum are expecting some visitors to venerate the relics during the show. She recalled the death of Princess Diana and how people lit candles and heaped up bouquets of flowers on the streets, ‘so that London seemed like India because of the smell of rotting vegetation!’ The cult of relics and the cult of celebrity may be a lot closer than we think. Treasures of Heaven will run from 23 June to 9 October and tickets are now on sale. 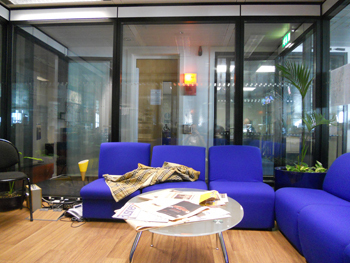 Above: the Green Room at BBC Radio 4 this afternoon. An interesting day of new meets old media. The Pope landed in Edinburgh at 10.30am for the start of his state visit to Britain, and while the plane was still in the air I thought I’d tweet his arrival for the Ship of Fools feed. I’ve done this a couple of times now: posted a fast-running Twitter commentary as events unfold – but you have to be light on your feet to think up the jokes in time, and willing to risk looking stupid when some of them fall flat. shipoffoolscom Dove One has touched down in Edinburgh after some tense moments with air traffic control, who do not speak Latin. shipoffoolscom The Pope is meeting the lovely old Queen. Which must happen to him every 5 mins in the corridors of the Vatican. shipoffoolscom Archbishop Rowan says through spokesman that he would have had a haircut and beard trim, but only does it for special occasions. shipoffoolscom Papal lunch menu: Aperitif: Bloody Mary. Starter: Eggs Benedict/Ratzatouille. Main: Stake (rare nowadays) with Newman potatoes. In the middle of all that intensity, I got a call from PM on Radio 4 (their late afternoon show) inviting me to go in and talk about the Ship of Fools papal tat. In the taxi on the way to the Beeb, I thought up a nice comedy scenario where the Pope jumps into the mosh pit at one of his masses to ‘get with the faithful’. I didn’t think I’d get a chance to use it, but Carolyn Quinn (interviewing) gave me the perfect in just before the end of the piece, and I took it with both hands. PM interview – listen to it here. I was interviewed outside Waterloo station yesterday for Channel 4 about the Ship of Fools Picnic with the Pontiff feature, where we’ve collected religious merchandise for the Pope’s visit. See above for the interview, and see the Weird and wonderful souvenirs piece on the Channel 4 website. My very own Benedictaphone arrived in the post this morning – one of the souvenirs unaccountably not being sold by the official UK papal visit store. This pocket pontiff voice recorder allows you to record your own message and then play it back as if HH the Pope was saying it, which should lead to some very special moments for pilgrims. The gadget thoughtfully includes a key ring for your very own keys of St Peter. 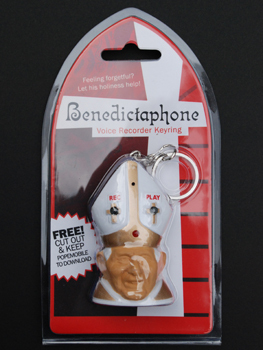 The Benedictaphone and other unlikely papal gadgets will shortly be featured in Gadgets for God on Ship of Fools. Did I mention before that I have a quite large collection of kitsch figures of Jesus, mostly in plastic? Dashboard piety has long been a fascination for me, as the whole idea of rendering Jesus in throwaway plastic seems so gloriously inappropriate. Most of the Jesi I’ve collected were bought on eBay from the States, and include a couple of small Jesus and Mary dashboard statuettes with magnetic bases and rhinestone-studded haloes. Trash piety doesn’t come much better than that. 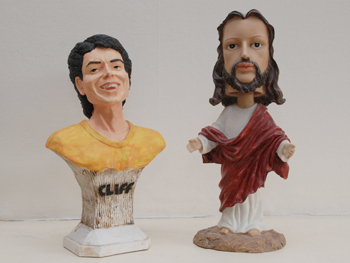 It’s slightly off the beaten track, but I’ve added a plaster bust of Sir Cliff Richard to the collection, which came my way via the writer Catherine von Ruhland. Catherine spotted the Young One languishing in a Littlehampton shop window, and in a moment of inspiration took a snap and posted it on Facebook. At my request, she rescued Sir Cliff from his junk shop oblivion (isn’t it amazing how art so often imitates life?) and entrusted him to me yesterday when we met in the National Gallery café. He’s surprisingly chunky and looks more than a bit like Jacko. Here he is (above) alongside the tasteful Bobblehead Jesus. It’s what was left over from breakfast this morning. I know these things are meant to be Jesus, but I think it’s a profile view of Elvis with a huge quiff. Either way, it’s now in the freezer waiting to be sold for a fortune on eBay. 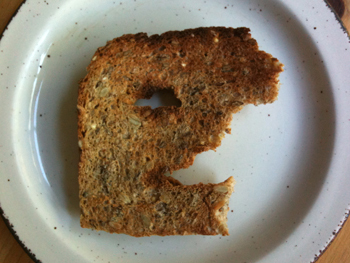 Ever since Diane Duyser saw the face of the Virgin Mary in a cheese sandwich and made a cool 28,000 bucks selling it on eBay to a Florida casino, visions of Mary and Jesus in food and everyday objects have been in the news. Look! It’s Jesus! documents dozens of ‘appearances’ of the holy duo on tortillas, handbags, lava lamps, clouds, tree stumps, and a burnt frying pan. They’ve mercifully omitted the image on a dog’s bottom which has been doing the rounds on the Net for a while. Some images in the book are quite impressive, in their weird and whacky way, while others are testaments to a wildly overactive imagination. I bought it because I’ve been following the phenomenon for a few years, curious about how people respond so willingly to these eccentric appearances of the divine, and why they identify any vaguely bearded face as Jesus, rather than Frank Zappa. I wrote about several of the most interesting stories in a feature on the Rejesus website called Unexpected Faces. Harry and Sandra Choron, the book’s authors, have done a supernaturally good job, though, not just in collecting the pictures, but also in tracking down the original stories and talking to the people behind them, many of whom now treasure their unlikely relics. ‘Smith has set up a shrine to the lava lamp in his home,’ is the conclusion of a typical story. My favourite episode in the book is about David, who ordered grilled chicken and vegetables in an Italian restaurant in Syracuse, New York. The food arrived and there staring up at him from the surface of the chicken was the face of Our Lord. David told the waiter, ‘I think Jesus is on my chicken,’ which must have made a nice change from ‘There’s a fly in my soup’. Look! It’s Jesus! is my perfect loo book. 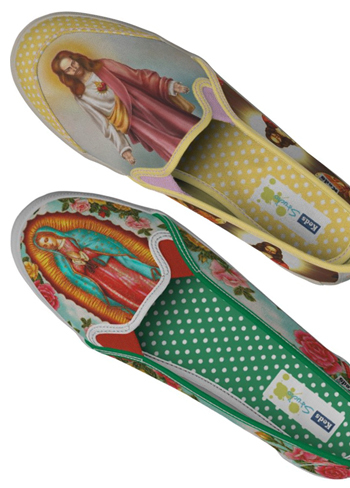 Summer’s coming, so don’t you think now’s a great time to get some deck shoes with Jesus and Mary printed on them? Me neither. Thanks anyway to Angel Wrestler for emailing to point out Zazzle’s new product line, Crucifix Shoes, sporting Christian images on canvas sneakers. The full range includes Madonnas, stained glass, crowns of thorns and angels. We’re going to be featuring this on Ship of Fools’ Gadgets for God pages soon, so this is just a sneak (ha ha) preview.